“Leveraging and maximizing data to make better business decisions”… it’s the #1 workplace trend according to SIOP, the Society for Industrial and Organizational Psychology. 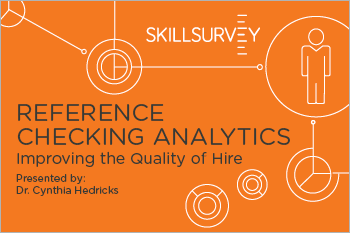 And a recent survey reveals that 44% of recruiting leaders believe quality of hire is the most important metric for measuring recruiting performance. Dr. Cynthia A. Hedricks, a former academic who is now an expert advisor with global consulting experience, has spent her business career improving the quality of hire for organizations such as Wal-Mart, GlaxoSmithKline, CH2M, and University of Colorado.